Rear Admiral Noah H. Long, Jr. received his commission in the Civil Engineer Corps in July, 1965 from Navy ROTC at Tulane University, New Orleans, Louisiana where he received a Bachelor of Science Degree in Civil Engineering. He served on active duty for five years which included two deployments to Vietnam as a Company Commander with Naval Mobile Construction Battalion-133. Upon his release from active duty he affiliated with the Naval Reserves. He served in RNMCB14, Jacksonville, FL and RNMCB-24, Huntsville, AL in progressively more responsible positions as Company Commander, Operations Officer, and Executive Officer. He serviced as the first Commanding Officer of Naval Construction Force Support Unit One, Greensboro, NC and then as Commanding Officer of RNMCB-24. Under his command NMCB-24 was awarded “Best of Type” in 1984. As a senior officer he served in various staff positions in facilities management, equipment management, and training management. He served two years in the Pentagon on the staff of the Officer of Director, Shore Facilities and Planning (OP-44) in the office of CNO. He then commanded the Third Naval Construction Regiment in Atlanta, Georgia and was the Deputy Commander, Reserve Naval Construction Force before he achieved the rank of Rear Admiral. As a flag officer he served as the Director of the Naval Reserve Contingency Engineering Program and was on the staff of the Commander, US Naval Forces Europe, London, England. He retired in 1996 after serving as Commander, Second Naval Construction Brigade based in Little Creek, Virginia. This brigade served the Atlantic theater of operations and included over 12,000 sailors in both the active and reserve components. Rear Admiral Long’s personal awards include the Legion of Merit, Meritorious Service Medal with one gold star (in lieu of a second award), the Navy Commendation Medal with Combat “V” and two gold stars (in lieu of second and third awards), and the Combat Action Ribbon. Simultaneous to Adm. Long’s military career is had a successful civilian career in construction management, real estate development, and design management. He retired in 2006 from Rosser International, a full service Architectural and Engineering firm where he had served the last five years as President and CEO. He has been active in civic affairs including serving for 10 years as a Cub Scout leader including Den Leader, Weblos Leader, Pack Treasurer and Pack Cubmaster. He is a Master Gardener and presently Chairman of the Tree Board of the Town of Signal Mountain. Adm. Long is active in veterans affairs and military support organizations. He is presently President of the Chattanooga Area Council the Navy League He is Chairman of the Board of the Seabee Memorial Scholarship Association and is currently Chairman of the Chattanooga Area Veterans Council. He is a member of the Military Officers Association of America and is a life member of both the Navy Seabee Veterans of America and the Association of the United States Navy. 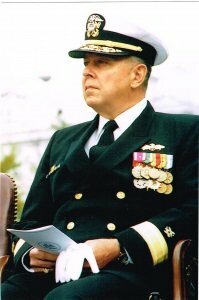 Rear Admiral Long resides with his wife, Marilyn, in Signal Mountain, TN. They have two grown sons and two grandsons.